"This is a great example of the greatness, if you will, of Cornell in terms of collaboration," said Giannelis, noting that a seminar he gave a few years ago led to his work with Fan. 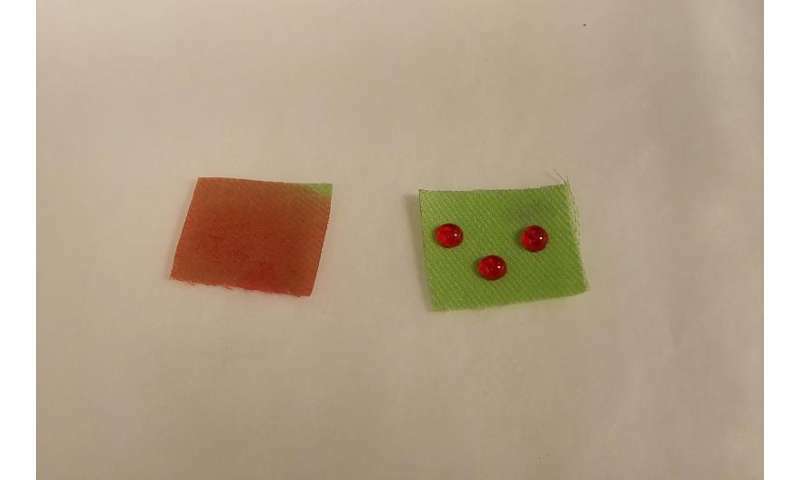 "[Fan] listened to my presentation and invited me to team up with him to basically apply some of the work that we were doing in polymeric membranes to textiles." Fan was also excited about the partnership, noting that engineers don't always lend their expertise to the fashion industry. "The company came back and said, 'That is good and great – but can you do something similar with oleophobic coatings?'" he said. "It's a very different kind of chemistry, and something we had not worked on previously, but one of the great things about being at Cornell is that we have great students and postdocs who can take this kind of challenge and do great things." "We've found that even after 30 washings, it's still durable, which is great," he said. "Even if we can achieve [oleophobicity] that's even close to fluorine-based [polymers], that would be a huge breakthrough." "For industrial applications … we're not quite there yet," he added. "But we believe that we've opened up an opportunity, and more work will get us there."